"Deliberately Caused Insufficiency or Excess"
This is a big work of the 4th page . I will be reminded of Mark Rothko's work, if this work is seen. The common feature of this work and Rothko's work is the force for which it is pressed as a size and a feeling of a scale. 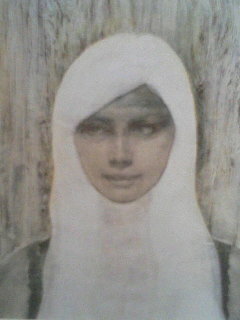 When I am looking at both of the works, I am made to use a solemn feeling. 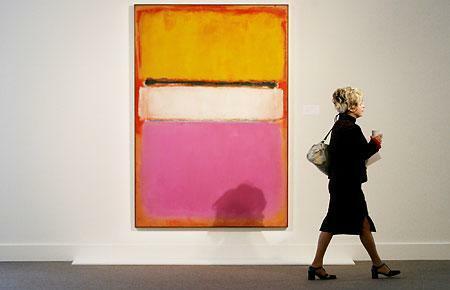 However, Rothko's work is an abstract painting and, generally is said to be difficult. Information is overflowed and complicated by apparatus and networks including a computer, and it is impossible for modern society to say that a one human being overlooks the whole. What sears active judgment of man will happen there. Therefore, it is endeavoring that information technology media including Google extract information. You may be surprised at you. The search system of Google is a system of extracting the site which should not produce new information and should meet a keyword out of a certain site plentifully. Furthermore, since the present-day human being is alive in time which is hurried, it is difficult thoroughly by its eye to have chosen information. Mark Rothko's work should see in the situation of such the present age. You will feel the overwhelming scale and presence for Rothko's work. Although Rothko's work is simple apparently, you will notice that the details of a work seem to have plastered paints simply and the tone is changing delicately in fact. So, you will forget progress of time only by pursuing change of tone. You can see various elements, if it begins to see this work. And you change the view to the whole work and what is imagined changes. Seemingly, it considered that Rothko had a work seen like a mural painting all day long. He is requiring that should see a work by occasionally staring vacantly is occasionally continued, without using others over a long time. However, you are actually unable to continue looking at Rothko's work for a long time. In an art museum, because of time restrictions, you cannot see a work for a long time, and cannot decorate a house. Then, it will suit for the first time in the time when you are special, or an exclusive environment. Living a life which is always addicted to the flood of information, work which produces one information after another by its hand over many hours for a man of today who is ousted to time thoroughly has a hot thing. Rothko's work requires that of those who see. Matsui's work differs from such Rothko's work. 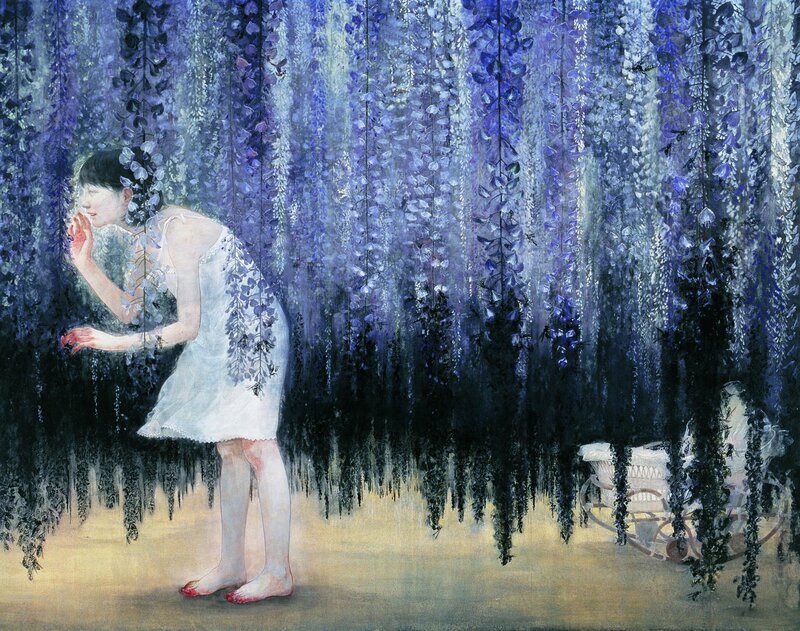 Probably, it will be difficult to approach, since the first impression to your Matsui's work is complicated and it is full of information. However, you will find that the guideline which extracts information like a search keyword is beforehand prepared into a such article. Then, you can enjoy a work easily. However, you are hallucinated with having understood the difficult work by oneself in the complicated appearance of this work. By this, you can satisfy pride. Let's see concretely by this it " Deliberately Caused Insufficiency or Excess." What I can say first is that this work is concreteness thoroughly. It is not that this work is realistic and this work's being an image with a clear outline is piercing. Therefore, those who see can be clearly conscious of "this is what" first. Although it may be natural, without wavering in judgment what is drawn on this work by this, you say, "This picture is drawing the cherry tree reflected in the water surface", and can start work appreciation. If a start point is fixable, you can advance a subsequent work pursuit easily. You may finish with a start point depending on the case. "I saw the picture of the cherry tree. This picture is a good picture. " When you understand this work, you finish semantic attachment which looked at this work. With this work, the painter is drawing signs that a nocturnal view of cherry blossoms is reflected in a ditch in the Chidorigafuchi. If you understand that, it will mean that you had looked at such a picture. With this work, a painter draws fantastically signs that the flower of a cherry tree looks beautiful in the darkness of night, makes the water surface a specular surface, makes it symmetry composition, and charms fantasy nature up still more. Furthermore, the portion whose central water surface can be seen formed the darkness of night, and the center of nihilistic black tone, and the painter shows so that the flower of the cherry tree of light pink may whirl around the circumference of the darkness of the nothingness. You can advance research gradually in this way. At this time, you feel a mystical atmosphere from which something is hidden in the work. Kajii machine Jiro, the novelist "by whom the body is buried under the cherry tree tree", said. You who looked at this work will feel glamor being the same as that of Kajii. Beauty with a transitory cherry tree has projected the world and a next world contrastively through the specular surface on a capital location called a bank. And even after you advance research of a work, you can think that the title of a work has suggested something. It is urged at the mystical appearance of this work, and you can consider that title like a serious question. Then, you become the feeling which considers seriously whether it is what. Pride is satisfied for you by that. By the guideline described at the point, information is extracted, the process to there makes it intelligible and this work is shown it. This is relaxation for a busy man of today.